As the title suggests, I got a new scooter last week! Brittny has talked about it some in her novel-lengthed post for the week, but I figure I would at least upload some pictures to show-off my new toy. The caddy gets almost 15 Miles per Gallon, whereas the scooter gets 82 MPG! It is just plan cheaper! One of the big reasons for me getting a scooter though was for the commute. Basically, my classes are in the center of campus. If I were to drive a car, then I would have to park almost a mile away and walk in. That takes about 15 minutes each way, and considering the fact that I need to be at work 15 minutes after classes end, that method just wouldn’t work. However, scooters have lots of nice parking spaces right next to the buildings! This was the way to go for me. $1200 later, I had the scooter, license, and helmet gear to get me on the road. 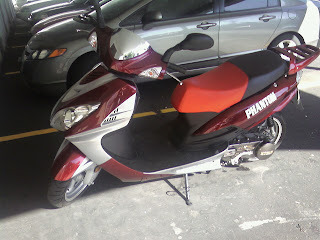 A brand new “Phantom” (don’t really care about the brand name) 150cc scooter that tops out at about 65 MPH, so it’s just fine for in-town use. And filling up the tank at the end of the week? About four dollars. So wonderful! Well, this last Tuesday it was back for another semester of school for Eric. We’re still getting used to him being back in school after the nice break he’d had this summer. Luckily it doesn’t look like this semester is going to be too bad for Eric overall, although I’ll let him post about it himself. With the beginning of a new school year it means another big change for our little family – my BYU bus pass is no longer valid starting next Monday, and since I’ve graduated I don’t qualify for a new one. We only had to pay $70 for it for the entire year and I was able to get to Salt Lake City almost every weekday! We’re going to miss that convenient and VERY economical way for me to commute. We looked into buying me a monthly bus pass, however the cost of a bus pass is $160 per month, which wouldn’t really be saving us that much over what it would cost us in gas. Plus, since I can work from home sometimes or work out other ways of getting to Salt Lake on occasion it quickly becomes more economical to drive. As sad as it may seem to be giving up the bus pass I’m actually kind of excited to be driving in. I really like the freedom I have with driving that I can come in whenever I want and leave whenever I want. It will also mean that for the first time in our married life Eric and I will be able to have similar morning schedules so we can see each other in the mornings, which I’m definitely looking forward to :) Part of the ripple effect of me starting to drive to Salt Lake every day is that I’ll be taking over our Corolla as my primary vehicle and leaving Eric home with our Cadillac. While our 1994 Cadillac Seville has held up surprisingly well so far… Eric wasn’t very comfortable with having to rely on it to get him to and from school and work every day. So, we decided it was time to get rid of our Caddy and instead invest in a scooter which Eric bought on Thursday. He’s pretty excited about it as it will get him better parking and AWESOME gas mileage (82 MPG). I’ll let him post about that as well since he can give you more details about the kind of scooter we’ve got and all that, since about as far as my technical specs go gets us through the fuel economy and the color (red). After this long week of school and work were over we had a pretty packed Saturday to follow it up! It was actually a really fun day, if not as relaxing as our Saturdays generally are. We had 5 years worth of YA technicians over to our apartment in the morning for breakfast. I really enjoyed seeing a lot of people who I still consider to be close friends, even if they aren’t people I see very frequently (traveling the world with people tends to form some pretty strong bonds, especially when you’re working so closely with such great people). Young Ambassadors was a wonderful chapter in my life that deeply influenced me, but I’m definitely where I’m supposed to be and doing the things I’m supposed to be doing. I wish we’d taken some pictures of all the people in our apartment but I never think of taking pictures until I’m sitting down to write these posts. Oops! After the YA breakfast I had just enough time to change my shirt (that had somehow gotten all grease splattered while standing next to Kyle cooking bacon) and head over to my friend Stephanie’s baby shower. Stephanie has been a great blessing to me for the past few months as I’ve been pregnant. She and I talk online while we’re both at work and she’s been helping me get through the weeks of pregnancy. It’s really nice to have some friends who’ve already been there to help show me the way and celebrate the little milestones that pregnant women appreciate more than most other people. Even though I didn’t really know any of the people there it was fun to meet a lot of the people who she’s told me so much about. When I got finished with the baby shower Eric came and picked me up (yup, on his cool new scooter :) ) and we were back just in time for more friends to come over for the BYU Football game! Even though I’m not a big football fan I can really get into a game like that. It was a pretty intense game, especially since there seemed to be some bias on the part of the referees against BYU. I was very proud of our team that they were able to pull through and shine in the face of that and go on to win! It was a great game and we had a lot of fun watching it with friends. So those are basically the highlights of our week. I’m sure Eric will have more to add in later. I’ve been feeling very blessed this week as the rumors I’d heard about the second trimester being easier than the first have proved to be true! I’m about two weeks into the second trimester, and I haven’t felt nauseous hardly at all this week. I can finally eat like a normal human being instead of a hamster! I’m hoping this can hold up for most of the rest of this pregnancy (I know there are more symptoms that rear their ugly head in the third trimester but I’ll be happy to keep the nausea at bay!) I’m a little frustrated to be 15 weeks along and still no baby bump to show for it. It’s kinda weird, I guess I never realized how long into pregnancy you can get before starting to show. I’m sure soon enough this baby will be taking up plenty of space in my body and I’ll be huge and wishing to be back to regular pre-pregnancy size. For now though, I slightly envy my friends with big tummies that can feel the babies kicking. One of the cool things is we can sorta feel where the baby is, but it’s still too low in my pelvis for anyone other than the doctor, Eric or I to feel it. I know I just need to be patient, I’ll be showing soon enough! I almost forgot! One of the main things I wanted to do with this post is to invite everyone to take the poll in the right column about what flavor of baby we’re going to have. (sorry, I think that’s an Anderson thing to talk about a baby’s gender as a flavor… don’t ask how it started, I have no idea) Generally speaking people won’t find out until week 20 when they have the anatomy ultrasound whether it’s a boy or a girl. However, there are places in Provo/Orem where we could go and get an ultrasound as early as the end of this week to find out the baby’s gender. It would only cost us $45 for the ultrasound and an optional $10 for a DVD recording of it. But we’re not sure we want to fork out the extra cash just to know a few weeks earlier. However, my little brother Cody is apparently DYING to find out and he’s offering to put up the money for us to do it earlier :P. We’ll have to see what we choose. Another big factor is that I’m not home during the days anyways so I’d have to plan to work from home another day to go in and do it. But maybe we’ll start going crazy enough about it that we just want to find out. It will be really cool to finally get to see this baby, even if it’s just the vague images on an ultrasound. I can still remember going to my mom’s ultrasounds when she was pregnant with my younger siblings. Those were cool experiences and I’m sure it will be even cooler with our own baby. Anyways, we’d love to hear what people think our baby will be or even just what you want it to be. Don’t ask us for our opinions, because we don’t have very solid opinions. Eric hasn’t been able to make up his mind on what he thinks it is, and I keep having very decided opinions… and then changing them (yup, I’m definitely a woman :). So much for parents’ intuition! If you do make a vote we’d love it if you left a comment stating how you voted and maybe why you think that, just so that we can sorta see who thinks what! We did leave an extra spot for people to guess both if you think we’re having twins (which there isn’t any evidence of so far, and the fact that I’m still not showing would tend to indicate against). For now voting ends on the day that I hit 20 weeks, but when we figure out when we’re going in for the ultrasound I’ll change it to that date and time instead. Happy guessing!